Every year on 18 July South Africans together with the international community honour our former president and international icon Nelson Mandela in the celebration of Nelson Mandela International Day.This year the day will not be observed as a normal International Mandela Day where citizens’ across the globe donate 67 minutes of their time to performing good deeds, It will be used as an opportunity for us to remember the time in which transformation gained traction in our country and celebrate the man who made a meaningful contribution. 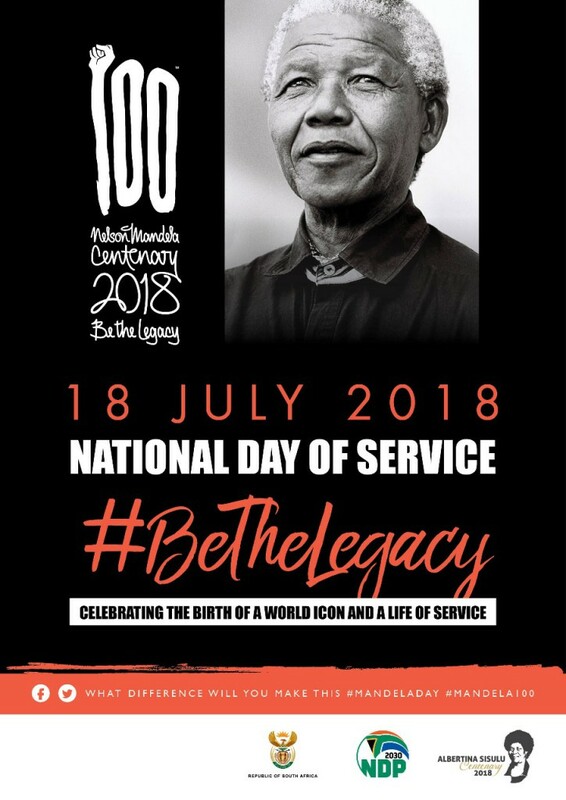 This year takes on a special significance as it marks the centenary celebration of Madiba’s life under the theme: “Be the legacy: Celebrating the birth of a world icon and a life of service”. Guided by the spirit of Thuma Mina, government will not be hosting an official event to celebrate Madiba’s centenary birthday but has declared the 18 July 2018 a National Day of Service to honour Mandela who valued doing something for others to change their lives for the better. Government is asking individuals, groups and corporates to pledge their time in the service of others on 18 July 2018. We embrace Madiba’s values and honour his legacy through humanitarian acts and initiatives that acknowledge his never-ending quest to change the world for the better. The overarching objective of Nelson Mandela International Day is to inspire individuals to take action to help change the world for the better, and in doing so build a global movement for good. On the day South Africans are encouraged to lay flowers and candles at any Nelson Mandela Statue, structure, school or street which bear the Father of our Nations name as a way of remembering our beloved father of the nation.